Elena Beccalli is Full Professor of Banking and Finance at Università Cattolica del Sacro Cuore, Italy, where she is the Dean of the School of Banking, Finance and Insurance. She is visiting Senior Fellow in Accounting at the London School of Economics and Political Science, UK, where she is a Research Associate at the Centre for Analysis of Risk and Regulation. 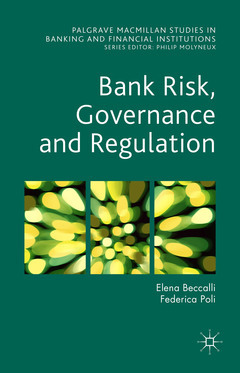 Elena Beccalli is the author of books and articles in academic national and international journals in the area of economics of financial institutions. Federica Poli is Associate Professor of Banking and Finance at Università Cattolica del Sacro Cuore, Italy, where she is the Director of the Undergraduate degree in Service Management, and Director of the MA in International Trade Management. She is the author of publications in national and international academic journals and books in the area of bank management and financial intermediation.